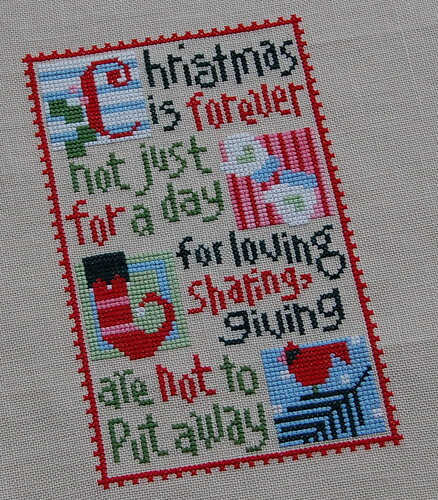 Nicole's Needlework: Christmas is Forever Finished! I finally got this one finished up today. It seemed to take me forever! I was also off by a stitch and kept ripping and fixing and finally I just fudged it! Love the color linen you stitched on. It makes the floss colors really jump off the fabric. Great stitching. What a beautiul finish! Christmas is Forever is so bright and cheery! Glad you had a wonderful day! We had dinner here too and it was nice! Have a wonderful weekend! Congrats on a beautiful finish!! this is so cute!!! would you be interested in selling the pattern? It's so vibrant and pretty, Nicole. Congratulations! another great finish! you are just too darn quick girl! I had a boo boo in mine as well and have started up again on it but got "startitus" again and started yet another new project. Love this piece! Great job!